Google's search engine for mobile apps is now available in the sidebar. Just click "More" in the left sidebar and select "applications" to restrict the results to Android and iOS applications. The results aren't only from Apple's App Store and Google's Android Market: you'll also find results from AppBrain, AndroidZoom, CNet and more. Unfortunately, you can't restrict the results to iOS apps or Android, find iPad apps or filter the apps by rating or price. Here are the results for [games]. The search engine doesn't have a proper homepage, but you can bookmark this page. 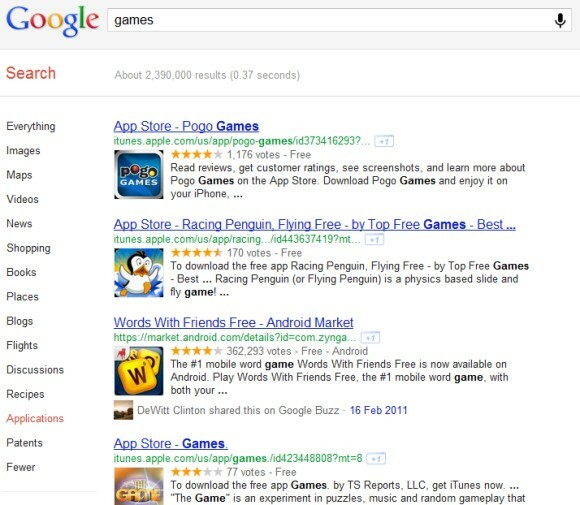 The search engine for mobile apps was initially available in the mobile version of Google Search as an OneBox, and then as a search option. Earlier this year, Google added support for app-related rich snippets. I don't think this is available for all the countries, because I an not getting any results form app stores. This looks really good. It is available in all countries. Personally, I'm really impressed! I'm a huge fan of Google +!!! Is it posible to show apps in google results from my personal blog ?